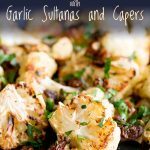 This Sweet and Spicy Roast Cauliflower with garlic, sultanas and capers, is a simple low carb, grain free side dish that is easy to cook in the oven. 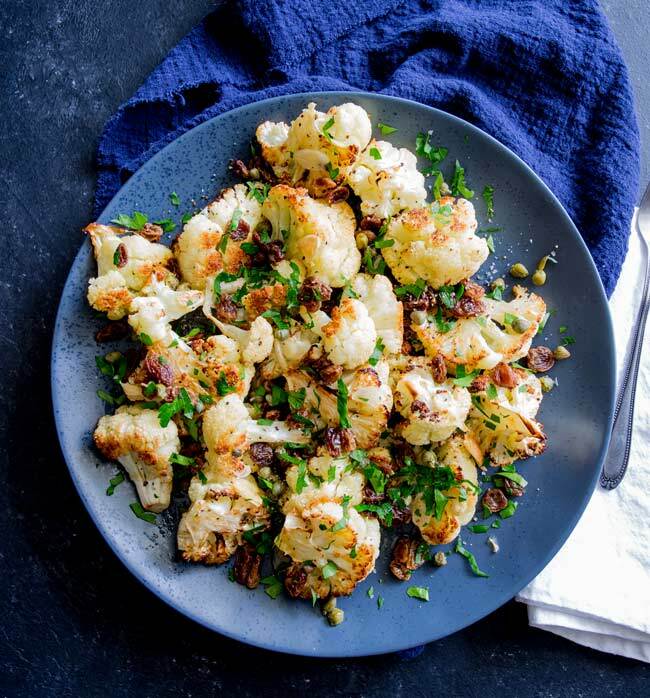 The cauliflower is dressed in olive oil and then roasted until crispy and golden, so much easier than roasting a whole cauliflower but just as stunning. 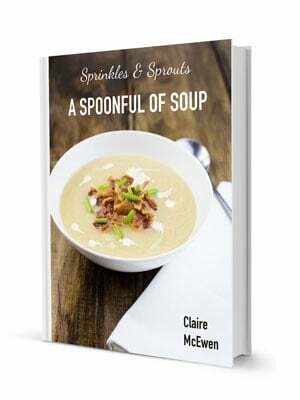 Perfect as a side dish for chicken or lamb or serve it up as a vegan main course. Don’t tell anyone, but I don’t really like cauliflower. I have vivid memories of over cooked mushy cauliflower cheese in the school lunch hall and that is hard to get over. But roasted in the oven it becomes something glorious and delicious . The key to roast cauliflower is a hot oven. You want the cauliflower to start roasting straight away rather than sweating. Have the oven set at 425ºF/220ºC and roast the cauliflower for 30 minutes. It should be golden and crispy on the outside but tender within. Also make sure you don’t skimp on the olive oil. It will soak into the cauliflower adding flavor and also encouraging the crispy golden edges to form. Because the roast cauliflower cooks at such a high temperature any garlic added to the roasting tray would be burnt to a crisp before the cauliflower was cooked. To get around this the thin slices of garlic are cooked separately and then used to dress the cauliflower at the end. To do this peel and thinly slice the garlic then add it to a cold fry pan. Pour over cold oil and place it over a low heat. This process stops the garlic from burning, because the cold pan and cold oil take a while to heat up, meaning the garlic has time to infuse the oil and doesn’t instantly start to crisp. Once the oil has infused, it is removed from the heat and the soaked sultanas are added. This cools the oil down and slightly warms the sultanas up. Once this has happened the capers are added, as capers are at their best when they are cold or lightly warmed rather than cooked. The recipe calls for the sultanas to be soaked in vegetable stock. This rehydrates the fruit slightly and turns them into plump juicy bites. It makes the cauliflower much nicer to eat as each mouthful has the soft sweet pops of sultanas against the crisp edges of the cauliflower. It also enhances the sweetness of the sultanas. I use vegetable broth for the soaking but you could use boiling water. Don’t worry, when you first pour over the liquid the sultanas will look white and crinkly. This soon starts to fade and when you drain them any whiteness disappears. Can Roast Cauliflower be made ahead of time? 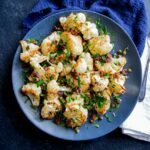 This Sweet and Spicy Roast Cauliflower with garlic, sultanas and capers can be made ahead of time and then just assembled in 5 minutes before you want to serve. It tastes great hot or you can serve it warm. To make it ahead of time, roast the cauliflower and then set aside to cool. Before serving just reheat it for 5-6 minutes in a hot oven to retain the crisp edges or a microwave if you don’t mind some of the crunch being lost. The garlic oil can be cooked ahead of time and left to cool and the sultanas can be soaked, drained and covered. Then when you are ready to serve gently reheat the oil and add the sultanas and capers. p.s for other great roast veg dishes check out my round up of 9 of the best roasted vegetable recipes. 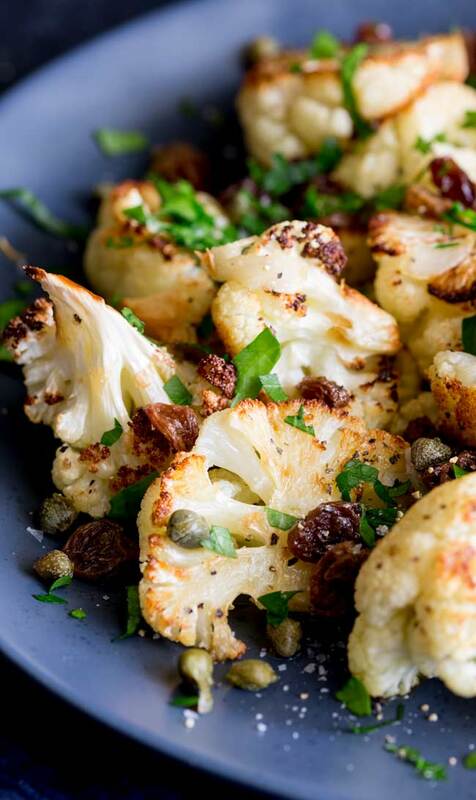 Why not pin this recipe for Sweet and Spicy Roast Cauliflower with garlic, sultanas and capers. This Sweet and Spicy Roast Cauliflower with garlic, sultanas and capers, is a simple low carb, grain free side dish that is simple to cook in the oven. The cauliflower is dressed in olive oil and then roasted until crispy and golden, so much easier than roasting a whole cauliflower but just as stunning. Perfect as a side dish for chicken or lamb or serve it up as a vegan main course. 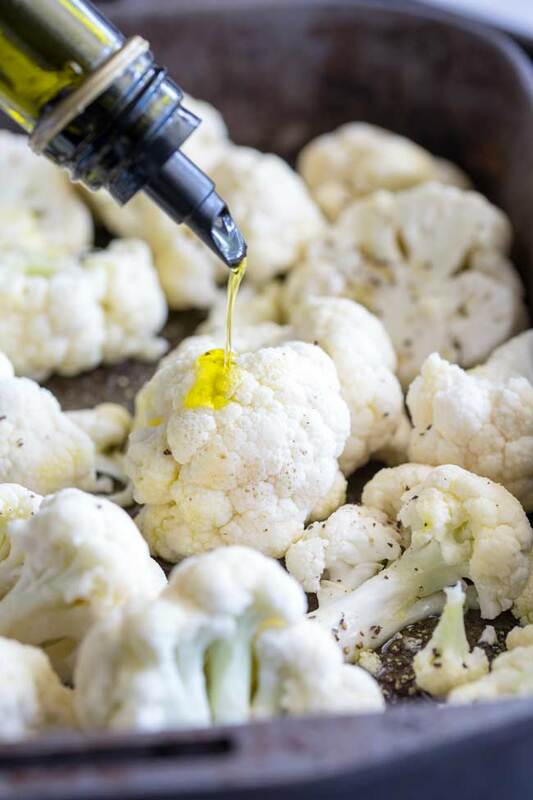 Spread the cauliflower over two large baking dish, ensuring you have a single layer then drizzle with the olive oil. Season the cauliflower with the ground coriander, salt pepper and red pepper flakes if using. Roast, tossing occasionally, for 25-30 minutes until cauliflower is golden and crispy. Whilst the cauliflower is cooking start with the dressing. Pour over the oil, place it over a very low heat and cook gently for 8-10 minutes until the garlic has softened but not coloured. Heat the vegetable broth up and pour over the sultanas. Set them aside to warm and plump up. Once the garlic has finished cooking, drain the sultanas and add them to the oil. Stir well to coat in the oil. Transfer the cauliflower to a serving platter. Drizzle over the oil dressing and then scatter with fresh parsley. For this recipe I recommend the capers packed in brine. But if you are using the capers packed in salt then rinse them gently and pat dry before adding them to the oil. If you are using the brined ones then just drain and add to the recipe. Placing the garlic into a cold pan with cold oil will allow the garlic to cook gently and infuse the oil without burning. Roast the cauliflower up to 4 hours ahead and let it stand at room temperature. Place it in the oven for 5 minutes to reheat before serving. For the dressing The garlic oil and sultanas can be made ahead of time. But keep them separate, then when you want to serve just gently heat the oil through before adding the sultanas and capers. 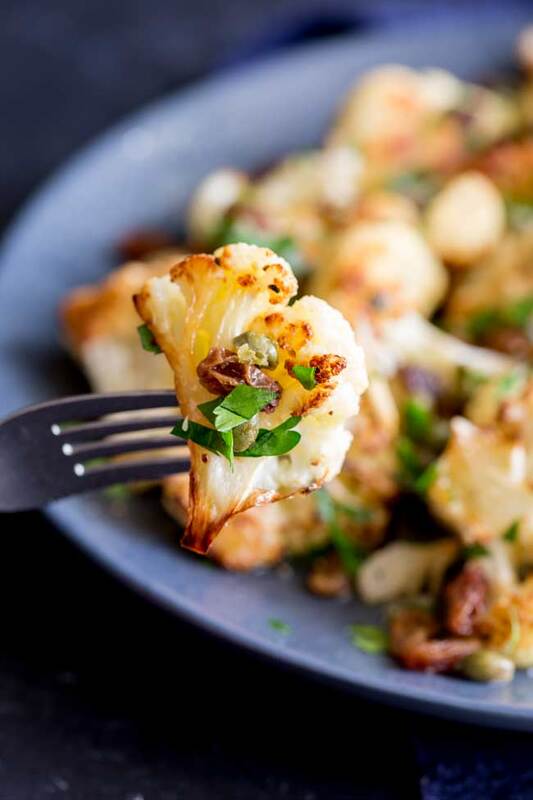 If you love food why not subscribe to my newsletter, I will drop you an email every now and then, just to say hi and send you a couple of recipes I think you might love, like this Sweet and Spicy Roast Cauliflower with garlic, sultanas and capers. I love this recipe. I have tried this at home and it was really delicious! 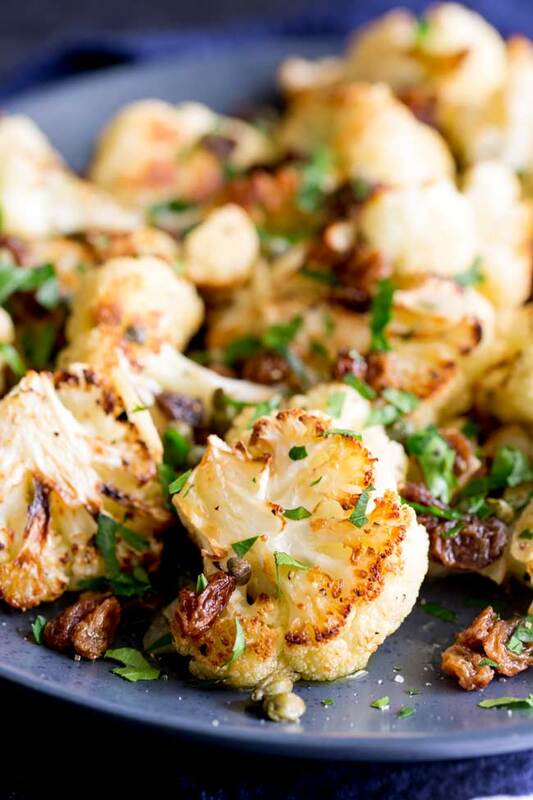 I love roasting cauliflower and the flavors here esp w the savory and sweet is just brilliant. Also make-up ahead instructions = A+!!! I was stuck in a cauliflower rut, until your recipe came along! Such a yummy change of pace!! Thank you Liz, I know exactly what you mean, sometimes the dish dishes seem to always feel the same don’t they.